The London Metropolitan Police. The ISRB gave day-long training at the famous Imbercort, where they train Police Officers not just to ride, but to take off their saddles while jumping! We received a plaque/award and great thanks for helping create a safer seat & position for the officers. This is the group that guards the Queen of England’s guards. Nathan Brashear, Eric Martinovich and Big Horse Productions for providing vaulters for training and demos, and for Daryn Fredricks, National Australian Vaulting Coach. The ISRB was instrumental in starting several vaulting clubs in the USA and Australia and our members have been state representatives to the Australian National Vaulting Council in the past. Meredith College for hosting a presentation. ZANEF (South Africa) for arranging and hosting our teacher training. Teacher Training Package **FULL PACKAGE** Includes all our other items!!! ***BEST SELLER*** Improve Your Seat Posture & Balance. From the moment a horse rider starts riding, they soon find out that balance is probably the No. 1 thing the horse rider has to concentrate on. From day one it’s “good balance = staying on” and “bad balance is on the ground”! But good horse rider balance and co-ordination gets more and more important when the tasks become difficult. The eventer needs incredible balance to get through the water course, the dressage rider is thinking about “forward-back balance” – that is, if their position is putting weight on the forehand, or putting weight back on the hind quarters (engagement). The dressage rider is also thinking of side-side balance starting with the rider falling in on the 20m circle at Level 1, going to Grand Prix where the slightest tip to one side means a horse might have a long stride on one side of the flying changes, and a shorter stride on the other side, or one hind leg slightly higher in piaffe. And to the young rider in pony club…it’s the difference between winning and losing the bending & barrels as the horse is quicker one way and slower the other. But probably the worst of the lot is ENDURANCE RIDING! The knee and ankle pain they suffer can become intolerable. You could almost create a term of “endurance rider knees”. Good balance for the endurance rider can mean the difference between finishing the ride, or packing up and going home. The problem with this tip is it’s SO SIMPLE the average horse riding population won’t do it. But Grand Prix riders all over the world who have received this tip are LOVING IT! Every time you clean your teeth…simply stand on one foot, with the other foot out in front of you! Yes, it’s that simple….but will you try it? The difference between “Olympians” and “riders” is that Olympians practice horse riding 18 hours a day. In the car, at the table, at the desk, while they’re shopping. And then for the other 8 hours they dream about it. Give it a go…the only thing you have to lose is bad balance! The Rules, thank goodness, are very clear. 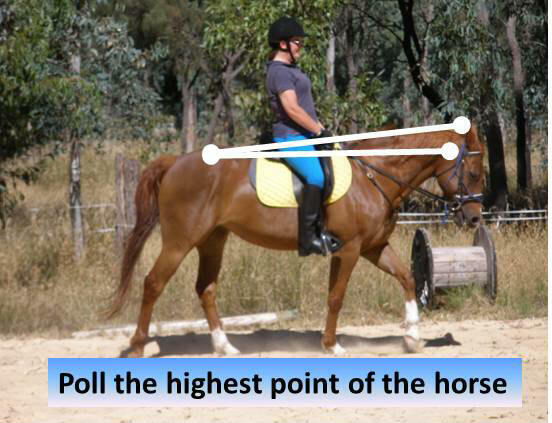 They say, for a preliminary horse (Level 1) that the horse must “have the poll the highest point of the horse”, “vertical (or slightly in front)”, “light contact”, “straight line from the rider’s elbow to bit” and “relaxed”. And of course it’s relative to the level of the horse. The croup gets lower and lower as the horse gets more and more advanced, and the poll raises to rebalance the additional weight on the back feet. The photograph on the right was recently taken of rider Kate McDonell, in South Australia. Look carefully at the photo. Now remember, this is a BEGINNER LEVEL – ENTRY LEVEL HORSE. This is not a “raised and arched” and “sitting down” Olympian, this is the FIRST STEPS to being on the bit…so BE KIND! But, I’m sure you’ll agree that poll is higher than the croup, straight line from elbow to bit, light contact, vertical…just like the rules above say…she might look a bit “stiff” but the horse looks kindly and poll high and close enough to vertical to score well for submission (on the bit). Did she use her leg to create the forward? Did she use her seat to lower the horse’s croup (engagement) or push the horse forward? Did she use a ‘combined action of the hand, seat and leg’ to get the horse on the bit? Kate is permanently in a wheelchair. Seriously injured in an eventing accident, our Kate was “talent spotted” as an up and coming rider with Riding for the Disabled, and we have taken her under our wing and encouraged her originally into the Para Equestrian system to start competing, but ultimately Kate wouldn’t settle for that and started winning in the “REAL” dressage world. 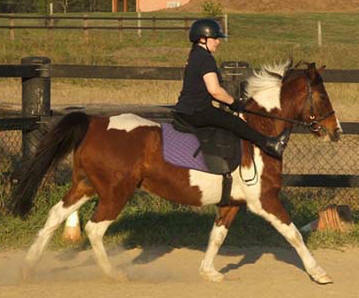 (And she has the stillest position in sitting trot we’ve ever seen!). Kate has absolutely no use of her legs, and is paralyzed from the waist down. Doesn’t this throw up a LOT of questions about the whole concept of spurs/pushing/driving? If Kate’s horse is out there winning with NO seat and leg…why is it so necessary to use the leg? If Kate doesn’t have to, and many paras don’t, then how can we learn from here and instead of MORE leg…use LESS (or in Kate’s case NO leg!). The coaches say “more leg, more leg”…yet the rule book says “able to morward from the SLIGHTEST indication”. It will also mark you down if the aids are not “invisible”, and “without apparent effort”. The FEI rule book even mentions the heel being the lowest point of the rider, so if a rider raises their heel to kick then it’s a) not invisible b) not effortless c) heel not the lowest point, and although very common, can be punishable in the rider and impulsion marks. Many riders, old and young, report pain in the lower body while riding. Sometimes, very serious pain to the point of career-ending. The more muscular effort you put into th eleg, the more sore you will be. But, imagine the horse’s sides. If you raise your hand in the air, you’ll feel yourself how VULNERABLE your ribs are, the harder you hit in the ribs, the stiffer the horse becomes. Now, there’s nothing wrong with legs…IF YOU HAVE THEM! But if your old, or injured, or have one leg stronger than the other, you still can ride at a very high level! The “you don’t have strong enough legs” statement is proven wrong again and again by these amazing riders. You never hear “don’t use your leg” for lateral work, it would be seemingly impossible to ask a horse to go sideways without using the outside leg. Is it even possible to go sideways with NO LEG AT ALL? The answer is = ABSOLUTELY YES! Take a look at the photo on the right of the paint horse being ridden by many times champion Para-Equestrian Susan Seipel. With her legs way up in front of the horse’s shoulders, she has virtually no use of the leg, certainly not enough to push a horse sideways. Yet…her lateral work is lovely! She’s trained her horse, like many other higher level para-equestrian competitors to do it WITHOUT the leg! So next time you hear “more leg”, perhaps wonder “how do the para’s do it”. There must be other techniques (Editor’s note = see the ISRB On-Line Course to learn how it’s done). As one famous jockey once said “if sitting fully upright with your heels down lead to faster horses, I’d buy a dressage saddle tomorrow”. Every jockey in the world is living proof that there is another way to get horses forward and impulsive without the traditional use of the “long leg”. There are many Prix St. Georges para equestrians doing lateral work, flying changes, and working on piaffe and passage around the world with no legs at all. They just train a couple of little tricks to the horse, very easy, and it’s done, the horse will be forward forever – much nicer than a steel spur in their sides. The traditional training methods from the British Horse Society, or NCAS use all three: a) hand b) seat c) leg. But some trainers go mostly for one method “all leg”, or “all hand”. Choosing the “middle way”, the softest most humane approach, within the rule book to stay highly competitive, will always be the logical path to success, and these riders are proving that there is another way! Sometimes it just takes a very special rider to show us the difference!